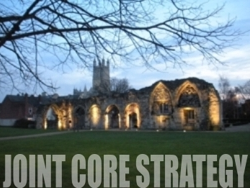 The Joint Core Strategy (JCS) is a partnership between Gloucester City Council, Cheltenham Borough Council, and Tewkesbury Borough Council, supported by Gloucestershire County Council. ​The JCS was formed to produce a co-ordinated strategic development plan to show how this area will develop during the period up to 2031. 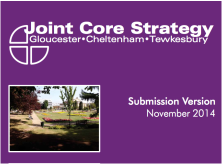 ​The Joint Core Strategy (JCS) is an important document that will affect everyone who lives and works in Gloucester, Cheltenham and Tewkesbury and their surrounding areas. Amongst many other things, it sets out the identified need for employment and housing and associated infrastructure (roads, schools and community facilities) and makes provision up to 2031. The JCS must comply with national planning policy and planning practice guidance set by government. The plan has been developed using a range of studies, which are called the 'evidence base'. This is a key point, because it means that the approach to future development is not based on opinions or assumptions, but is impartial and independent evidence. The plan has taken account of representations received on drafts of the plan as it has evolved to its current stage. 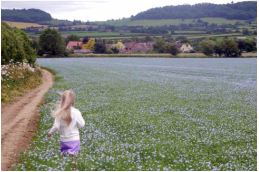 Whilst the JCS provides the higher level or strategic part of the development plan for the area, more detailed, locally-specific planning policies will be set out in the Gloucester City Plan, Cheltenham Plan and Tewkesbury Borough Plan, collectively called district plans. These will include local allocations of land for development and local policies to guide decisions on planning applications. They also form part of the development plan and will need to reflect and be consistent with the policies in the JCS as set out in the diagram ‘Joint Core Strategy Connectivity’ overleaf.